One of our Soccer Stars signs for Notts County Academy - Football training for children, football coaching for kids, kids football skills. Soccer Star Coaching.Football training for children, football coaching for kids, kids football skills. Soccer Star Coaching. We recently had some great news from one of our Soccer Stars who has been attending our weekly courses and camps for over 5 years. It was good to see Ethan Lamb on our 2 Day Camp in Nottingham over Easter. 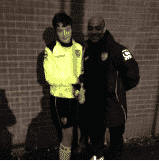 He was delighted to tell us that he has put pen to paper for Notts County Academy. We are so happy for Ethan and all of us at Soccer Star Coaching would like to wish him all the very best for the future!